Something comes over me in the Summer. It's like welcoming a close friend who you've lost touch with, back into your life. I'm so thankful and happy to have you back sunshine! It's that magical time of year when you wake up to sunshine and think, "Hey! Morning isn't so bad. I think I love today, we should make the most of it, we should BBQ"! Do you have these same thoughts? Grilling season is in full effect and I couldn't be happier, well, actually I'm sad because our building is under construction and they closed off our roof deck until mid-July. MEANING NO GRILL ACCESS, ahhh! Luckily our good friends invited us over for some burgers last weekend. 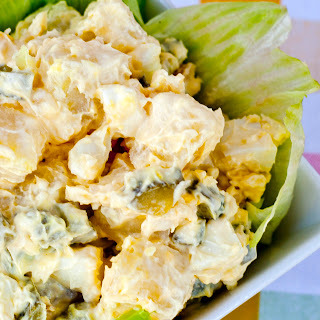 Nothing says Summertime BBQ like a big bowl of homemade potato salad. I'm not into that store bought sweet pickle stuff. I like the real deal, mamma's classic potato salad. It's made with mayo, dill pickles, hardboiled eggs, and a hint of mustard. It's very basic, super simple, and perfectly savory with hits of saltiness from the pickle and seasoning. It's the perfect compliment to burgers and hot dogs. 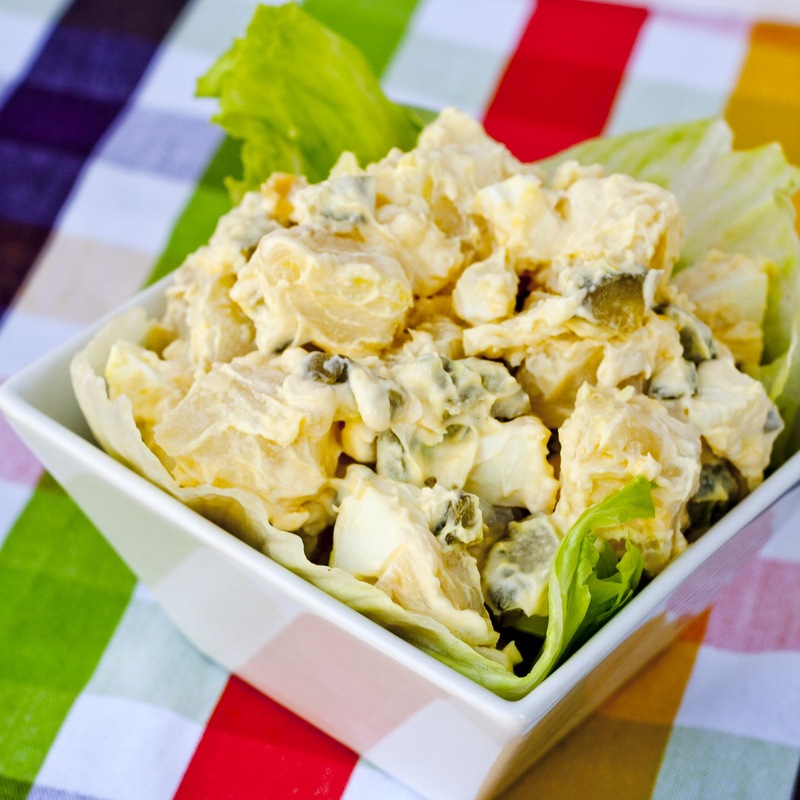 There's all sorts of potato salad recipes out there, and I welcome them. But for our first Summer BBQ I had to have my mom's classic recipe. This potato salad will be a hit at your next barbecue. I highly recommend you make if for the 4th of July too. It's a staple on our menu. Peel and dice your potatoes into bite sized chunks (whatever you prefer). Bring a large pot of water to a boil. Drop a handful of salt and your potatoes in and cook until tender. Depending on the size, this will be about 15 - 20 min. If you're feeling lazy like me, you can roast your potatoes in the oven and peel them when they're cooled and dice after the fact. 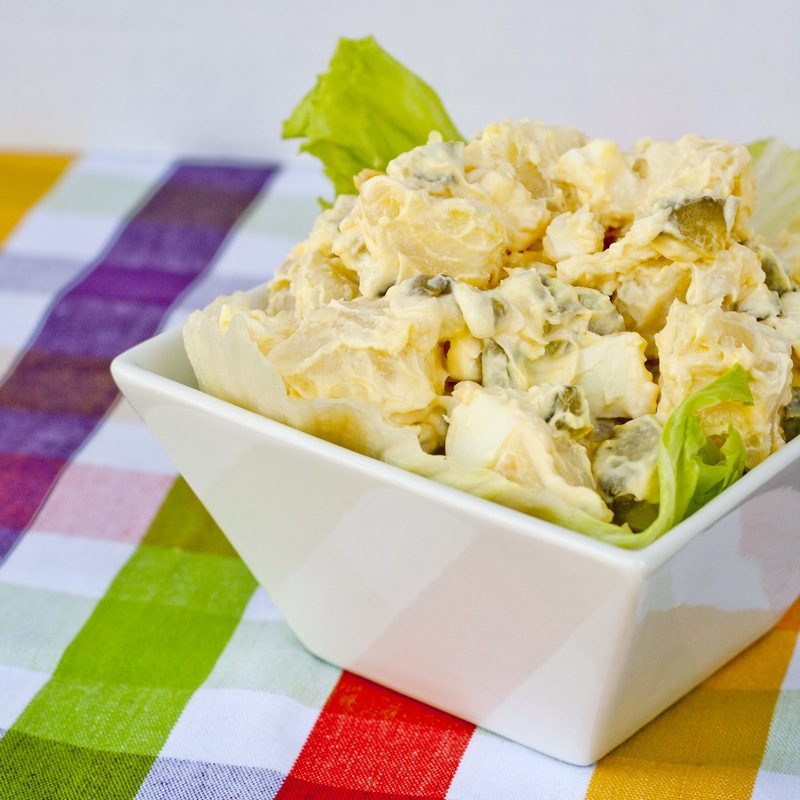 In a large bowl, combine mayo, pickles, eggs (including yolk), dijon, and mustard powder. Stir until combined. Add in your diced potatoes while they're still slightly warm (not HOT, just warm to the touch - you don't want your mayo getting funky on you). This will let the potatoes absorb more flavor. It will look like too much sauce at first, don't panic. After sitting for 1 - 2 hours it will be just perfect! Salt and pepper to taste. I tend to think potatoes can use a healthy dose of salt, but hey, that's just me. Let it sit in your fridge and get happy for at least 2 hours. This is actually better on day 2 & 3 when the flavors have had time to build. Bonus if you're hosting a party because it's one last thing to do day of! you can use any potato you fancy. if it's yukon or red potatoes, consider leaving the skins on, yum! mayo, eeeek?! yes, this is full of fatty goodness. if you're looking to lighten it up, consider swapping it out for reduced fat or fat free mayo. OR you could mash up some avocados and do 50/50 mayo to avocado. you'll get the consistency and flavor you're looking for without as much bad fats. you could try doing the same thing with greek yogurt but i personally think it would be too tangy. consider adding in some chopped green onion, dill, celery, bell peppers, or for a little kick jalapeno. this is a completely savory potato salad but if you prefer something more like the store bought sweet kind, consider using sweet pickles instead of dill. the possibilities of potato salad are endless but this is my favorite classic, mayo based potato salad. what's your fav style? Another way I've found to brighten up potato salad is to substitute some of the mayo for sour cream.